Yashima 屋島 mean “roof island” is a flat-topped mountain 20 mins away from Takamatsu’s city center. We were heading to Yashima to stay a night there. Yashima is famous for its sunset in Shikoku. 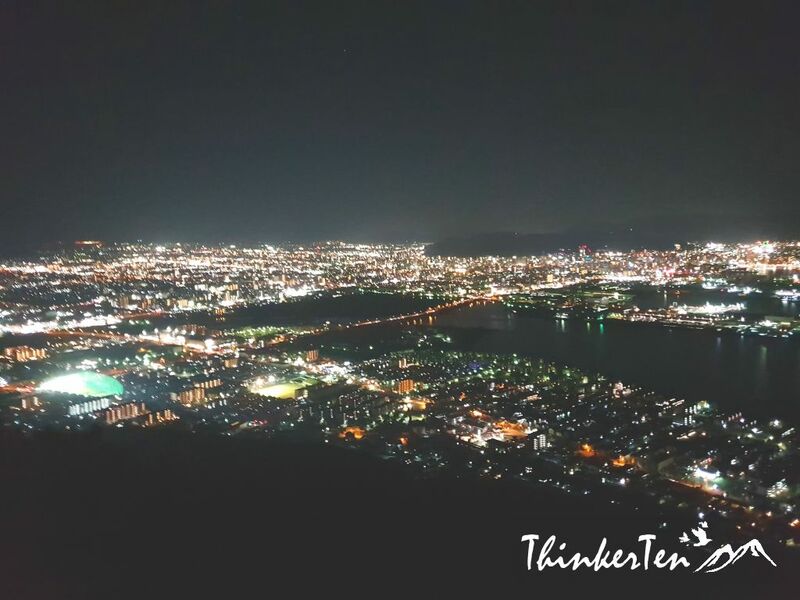 From Takamatsu city center, you still need to drive for about half an hour to reach Yashima. 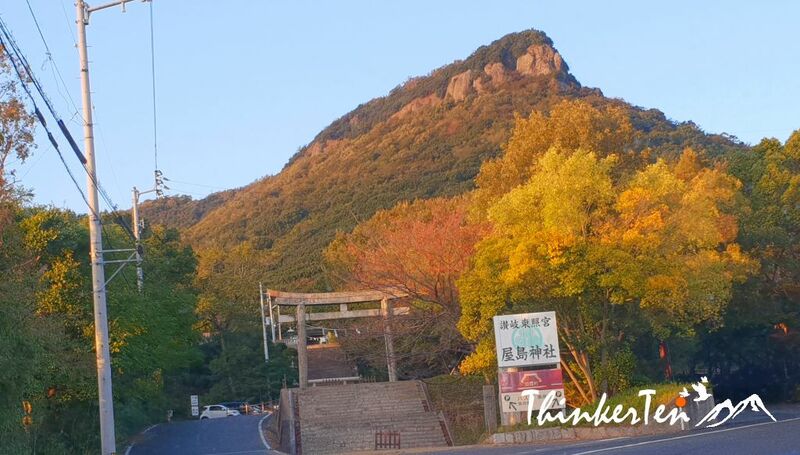 You will pass through the famous Yashima Shrine, then drive for another 15 mins to reach Yashima. The mountain drive is manageable as the roads are wide enough. However when you are at the top of the mountain, there is not much shop open after 5 pm. So you need to buy something up or book dinner at your hotel. When you approach the tunnel, you are not that far away from Yashima. 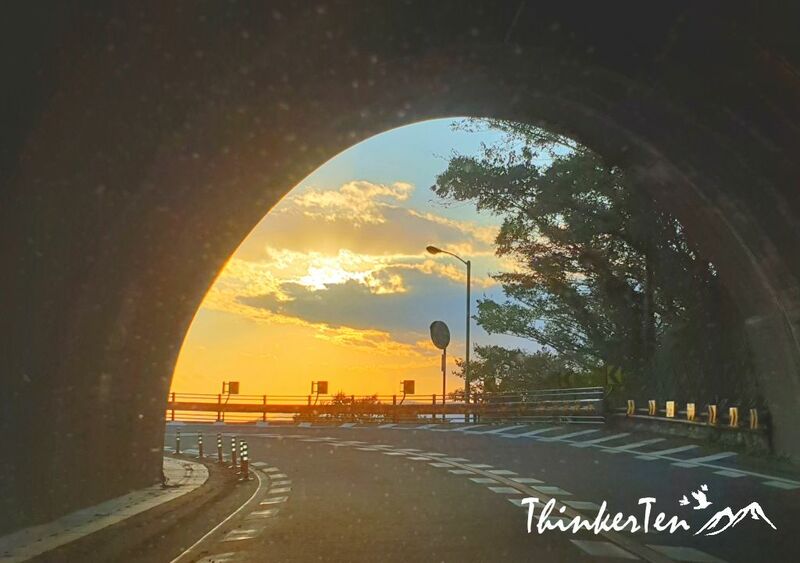 After you came out from the tunnel, you see beautiful ocean view of Seto Inland Sea at a glance. For local Japanese people Yashima is famous because a battle has been fought there between the Taira and the Minamoto-clan in 1185 that influenced domestic politics for the next 200 years. 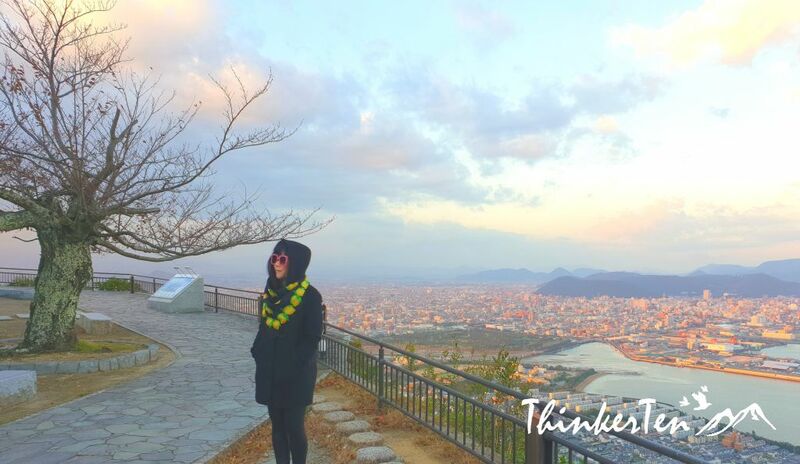 Yashima has been elected among Japan’s top places to see the sunset. 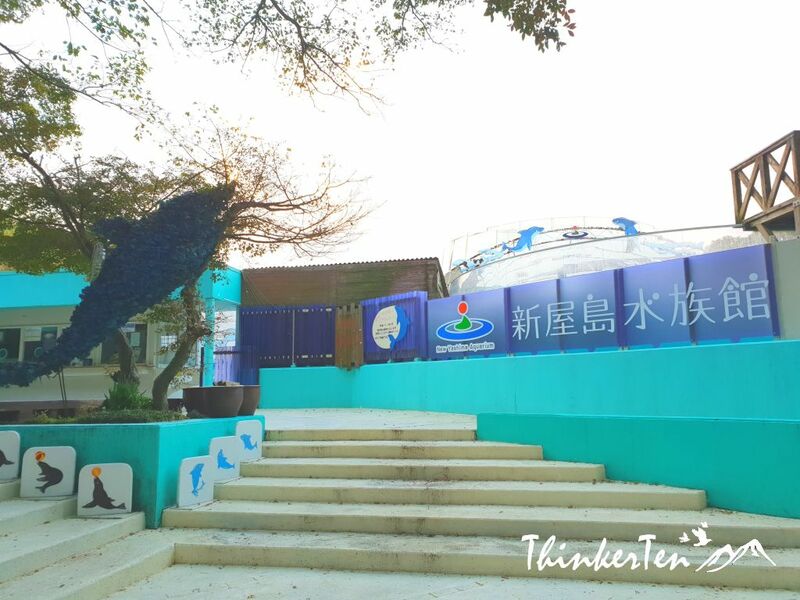 There is an aquarium at the top of Yashima Mountain but we did not go in as it was about to close when we arrived in Yashima. Closes at 5pm. Nearby there is a small pond called Chi no Ike meaning “Pond of Blood” where the victorious Minamoto warriors supposedly cleansed their swords. 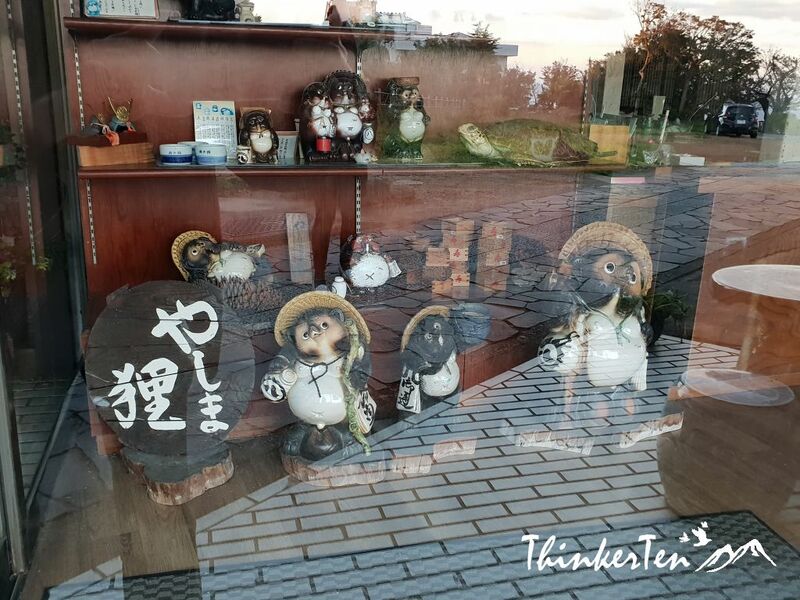 Have you realised that you often seen tanuki outside of a restaurants or shops in Japan? Tanuki or Racoon Dog is believed to bring in prosperity and business success. The tanuki role is similar to the Maneki neko/ the cat. Tanuki is commonly depicted with a big tummy, a straw hat and a bewildered cute facial expression. 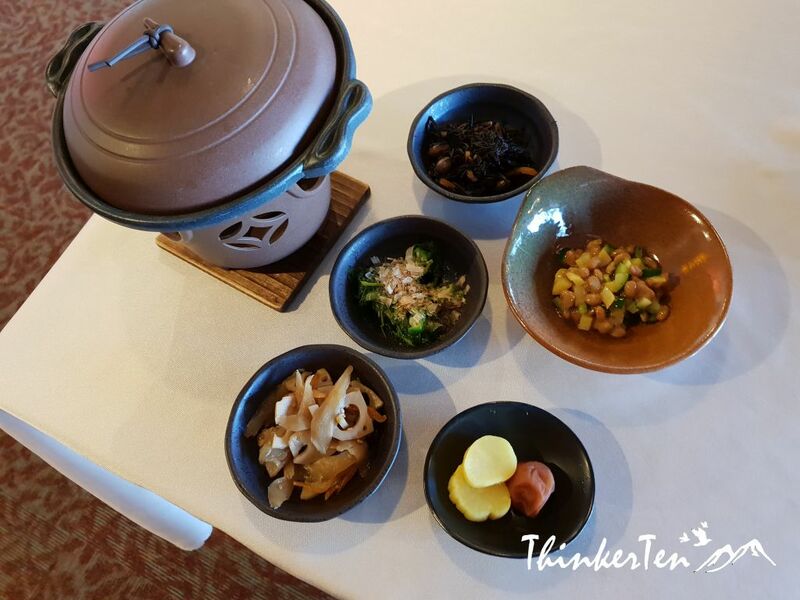 Bokaiso Hotel is located at the top Yashima Mountain. The hotel is not big which only has 8 western style rooms with either sea view or mountain view. 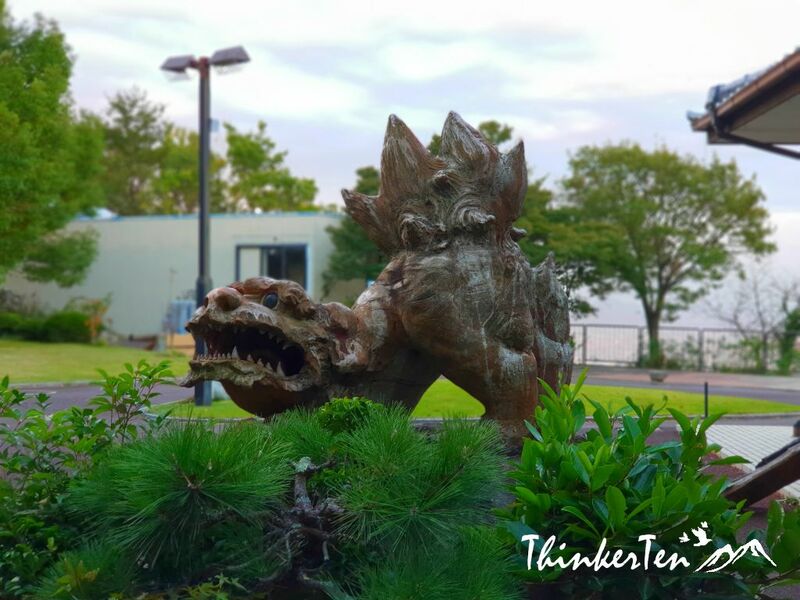 There is a mongen “門限” / cut off time to enter the hotel. After 10 pm, the electric auto door is not working so you have to use your hand to pull to the side to open and enter. 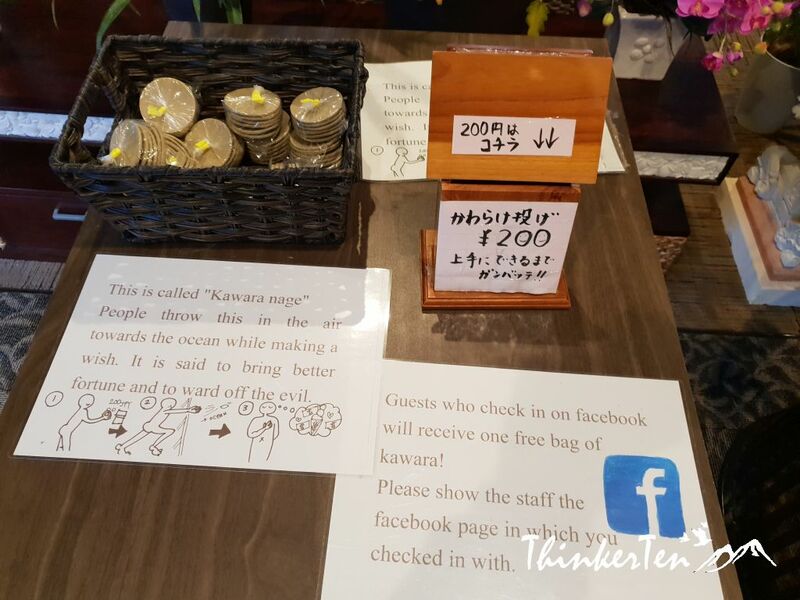 Kawara nage biscuit was seen selling at the front desk. People throw Kawara nage in the air towards the ocean and make wish, hoping to get good fortune. Genkan are traditional Japanese entryway are for a house or hotel. It is a place for you to remove your shoes before entering the building. 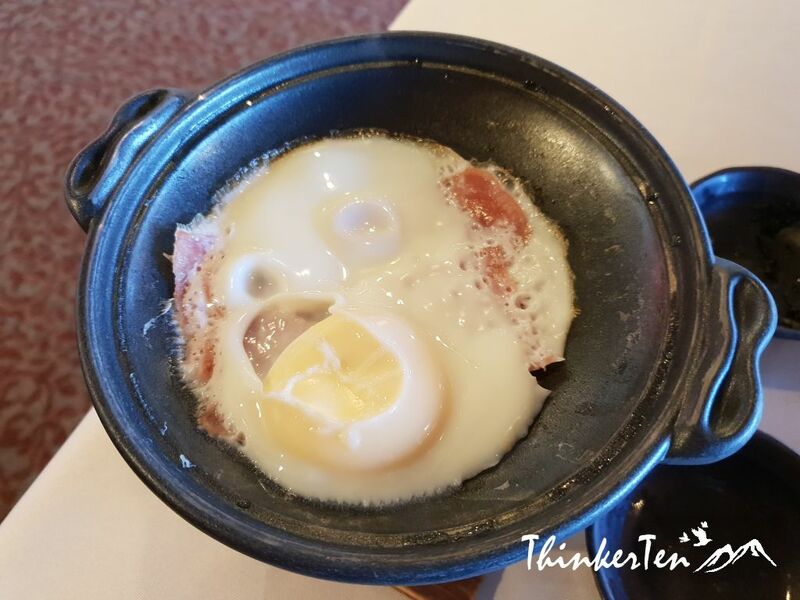 Even though Bokaiso Hotel is a western style hotel, it still has a genkan. 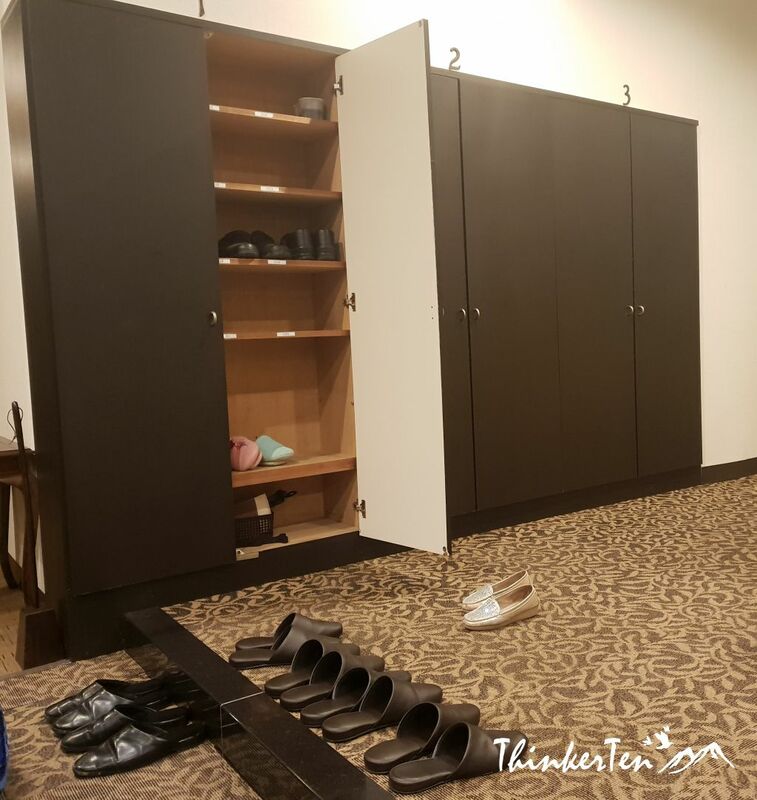 To enter the hotel, you need to take off your shoes and put it in the shoes rack provided. The hotel does not has a lift so you need to carry your big luggage up. There is only 2 storey. 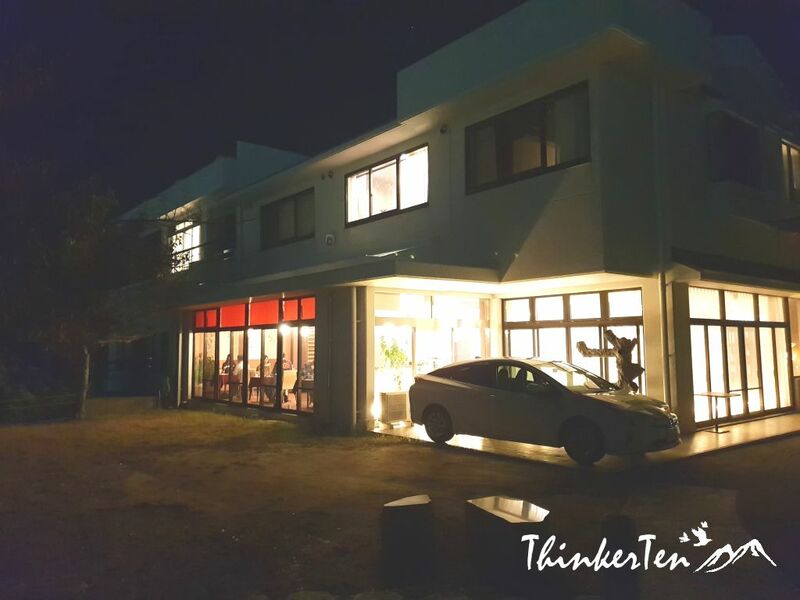 All rooms are at the second storey. 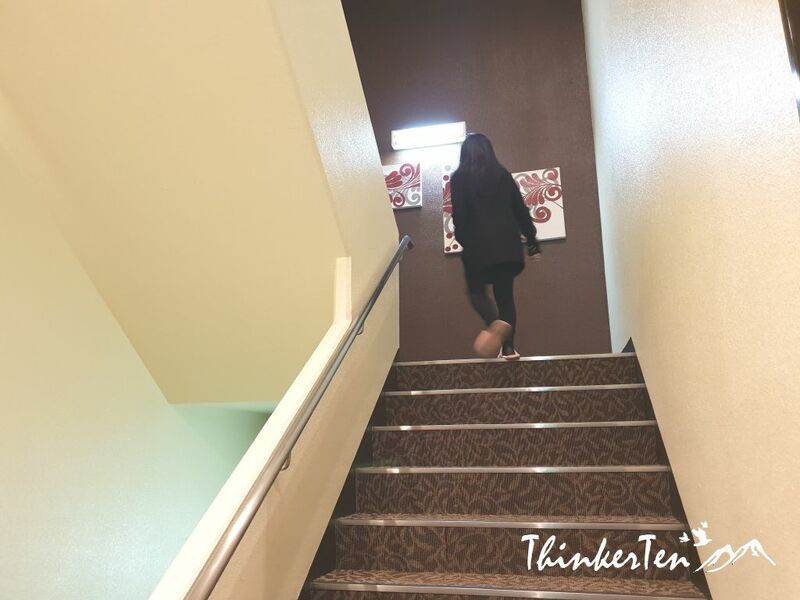 Once you enter the room, there is another genkan for you to leave the common slippers and walk in with barefoot or with socks only. It has Canopy Bed ! 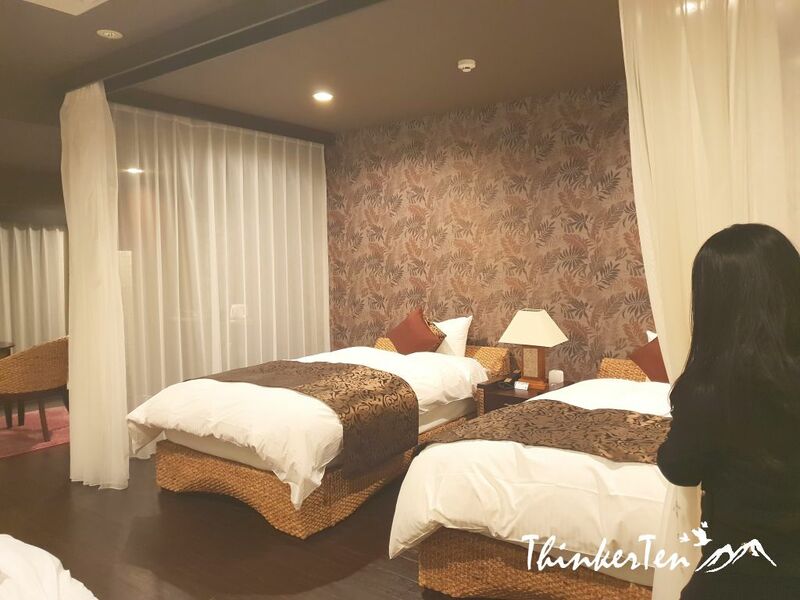 The room is very spacious which can fit two queen size bed with bed curtain (canopy bed) and an additional bed at the side. The canopy bed is really beautiful and romantic which look like the French Palace bedroom. There is a little dining area but only two chairs available. Toilet and bathroom are separated which is a good thing as it is neat. Japanese toilet are amazing to use as mentioned as it has all the button for you to press on and advance features. Bokaiso Hotel has no public bath but the bath is inside each room. 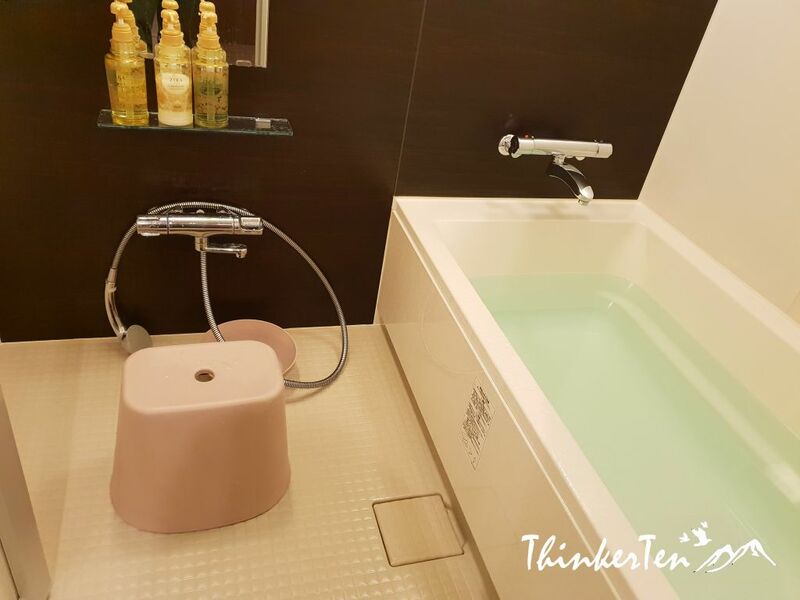 There is a stool for you to sit and shower till clean which is very Japanese style, then go inside the bathtub and enjoy the soaking for 10 mins. 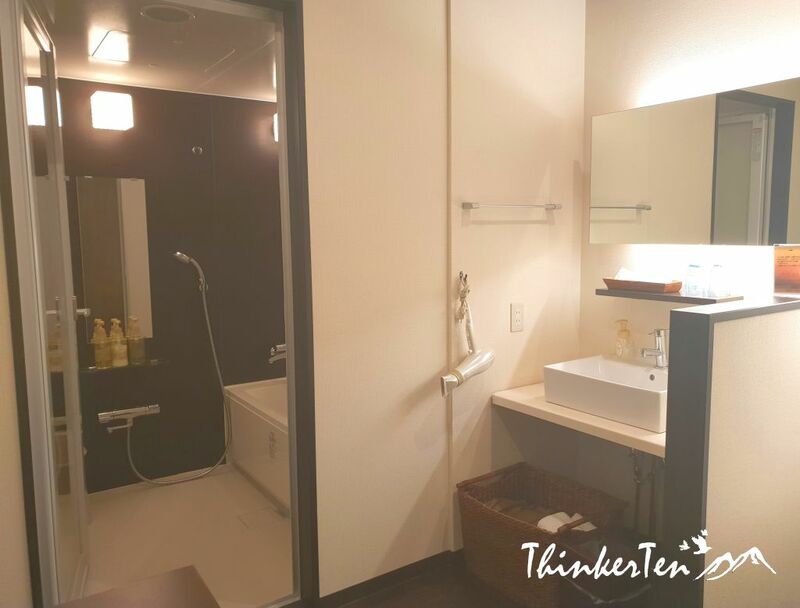 Total : 2400 yen (USD21.30) for 3 pax. And still plenty left over as we could not finish. We woke up early in the morning to check on the sunrise but sunrise is at the other side so it not that pretty as compared to sunset. The parking is free of charge but limited spaces only. The breakfast is inclusive and the presentation of the breakfast was really beautiful. There are 3 small glass of juice with different colors, orange, red and green. Each is made from fresh vegetable and fruits. 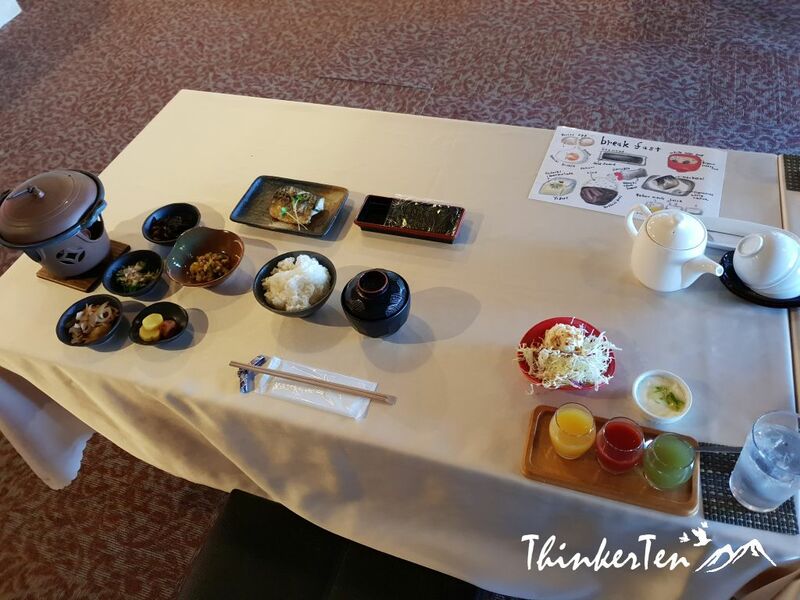 There is an instruction on the table to tell you which one to consume first on the table since there are so many small plates on the table. 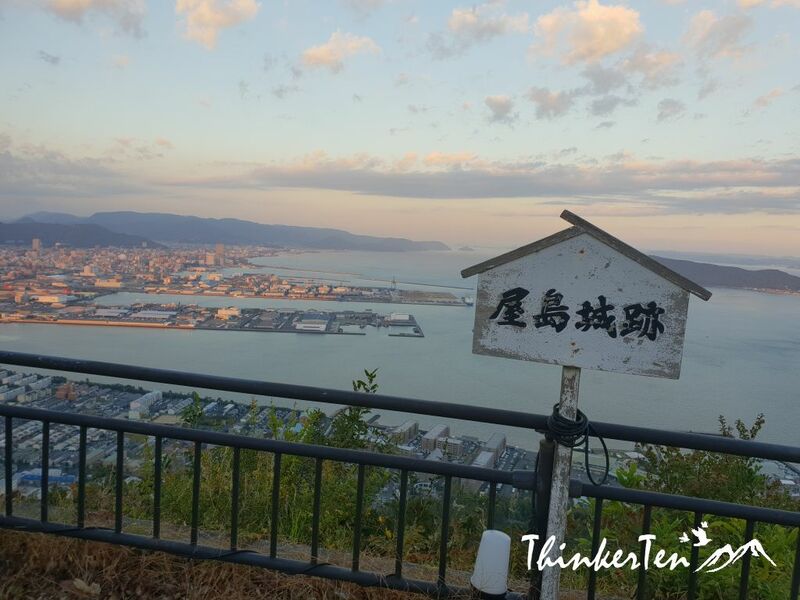 Yashima mountain is one of the best spot to catch the sunset in Shikoku Island. 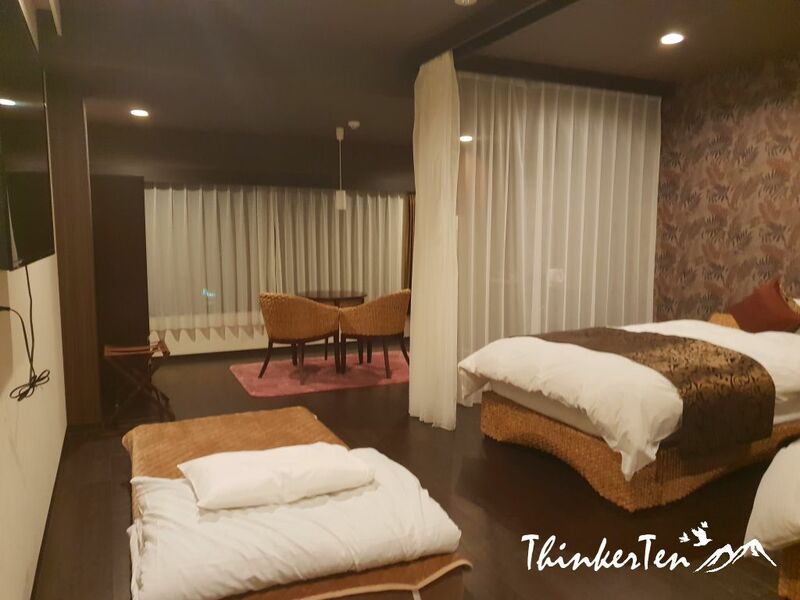 It is only about 20 mins drive to Takamatsu city, which is a quiet and exclusive place for people who like to stay away from the crowd. 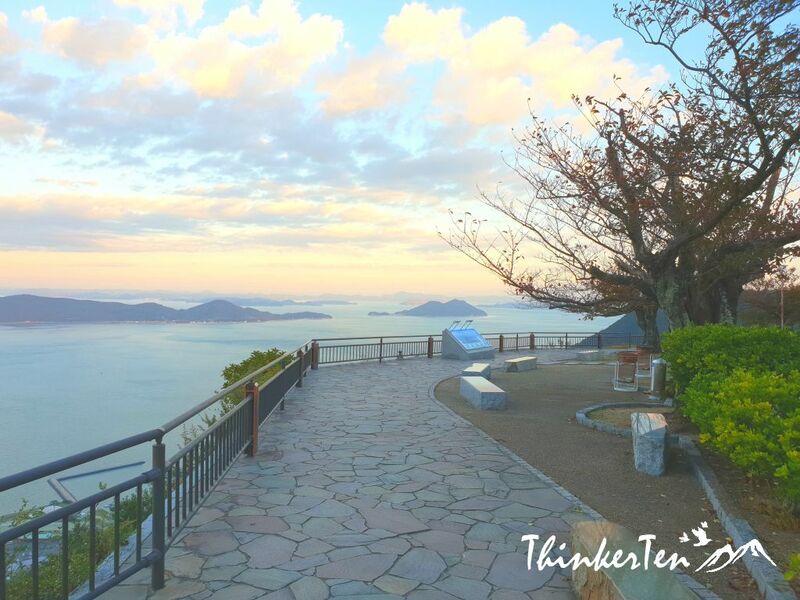 Bokaiso Hotel located at the top of Yashima mountain offer the breathtaking view of Seto Inland Sea. The room is extremely spacious and with sea view facing. The downside is there is no restaurants nearby so you may need to pre-book the in-house dinner or bring your own food up. Bakaiso is good for travellers who are driving so it is super exclusive. this is an interesting post. i’v never been to japan but keep up the good work! Yashima in Takamatsu Shikoku is famous among local tourists. Tourists who went up there can enjoy the best sunset in Japan. Very exclusive place and a hidden gem. 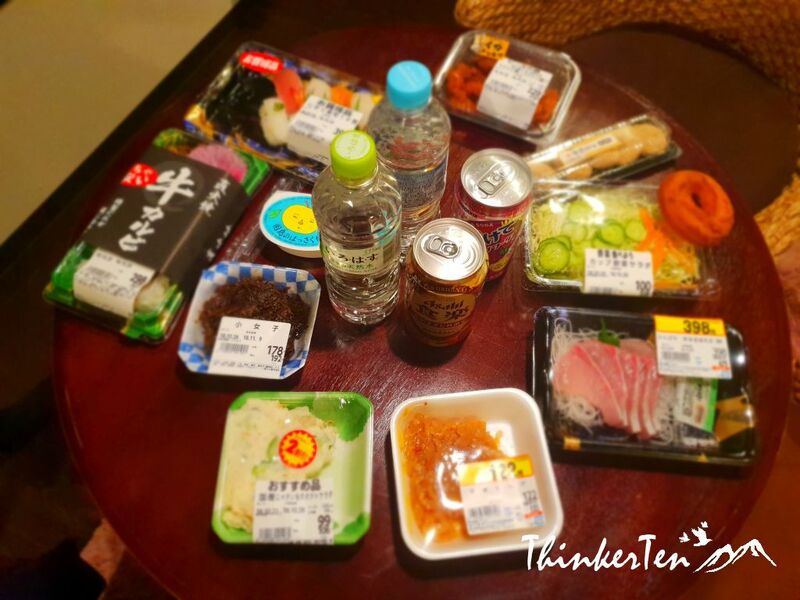 Great for people who do Japan road trip with rental car. 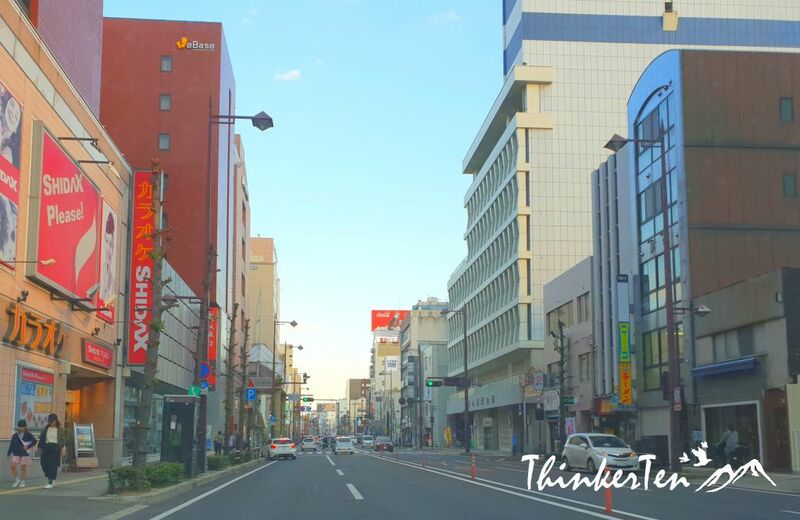 There are so many reason to visit Japan beside scenery and food, their manga/comic books and anime (animation),technologies such as robots and yearly festivals are also reason to visit. You are increasing my curiosity with these posts about this place. I am dying to visit it. 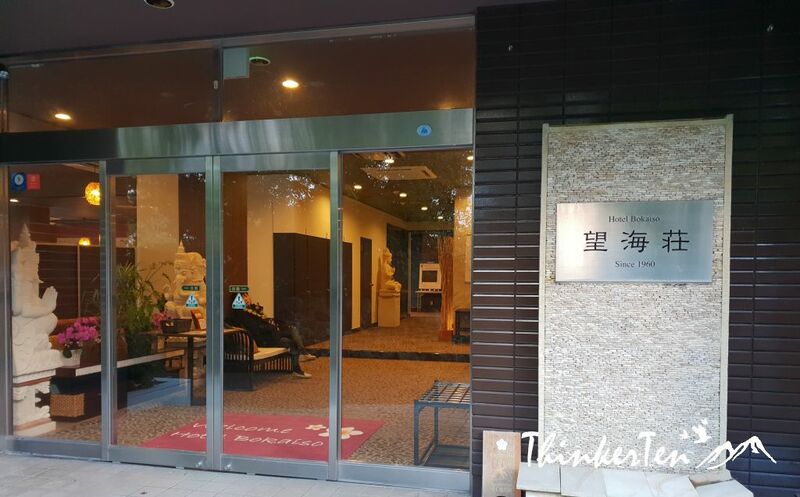 Bokaiso Hotel in Yashima would be the ultimate stay if you ever visit Yashima Shikoku. It is quiet getaway overing the sunset and the Seto Inland Sea of Japan. One of the best location to check out the sunset. What a beautiful place! I must add this to my bucket list! That bath tub is calling my name. Japanese bathtub are usually different and having deep small tub for soaking in but over in Bokaiso, the bathtub is western style bathtub which is longer and less deep. I miss the natural beauty that exists in the rural areas of Japan. Totally see what you mean when you say the best sunset is at Yashima – it is absolutely gorgeous! And the Bokaiso Hotel looks so clean and well presented with absolutely fabulous views…would love to stay and experience this one day. 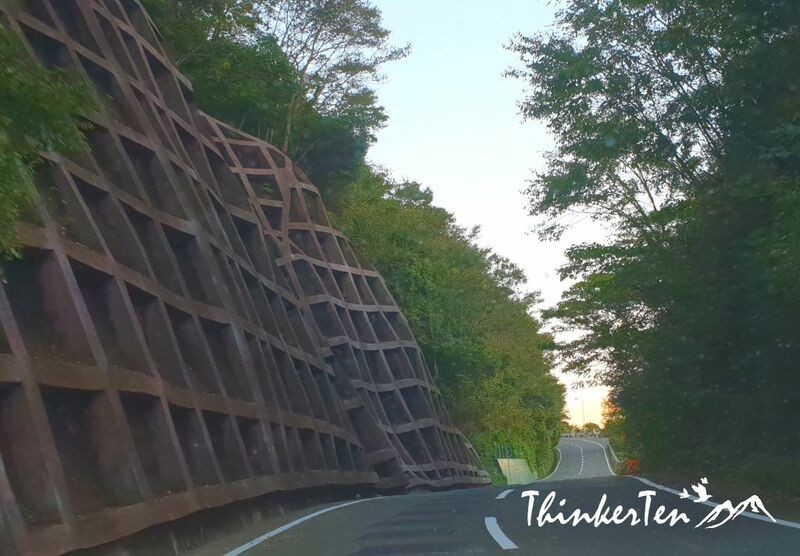 This part of Japan has plenty of hidden gem and untouched by tourists. Highly recommened anyone who like some privacy to visit Yashima and stayover at Bokaiso Hotel, sea facing view. wow that view looks impeccable!! hope you had a wonderful time!! The view of sunset is pretty amazing and you can even catch it from hotel room from Hotel Bokaiso. 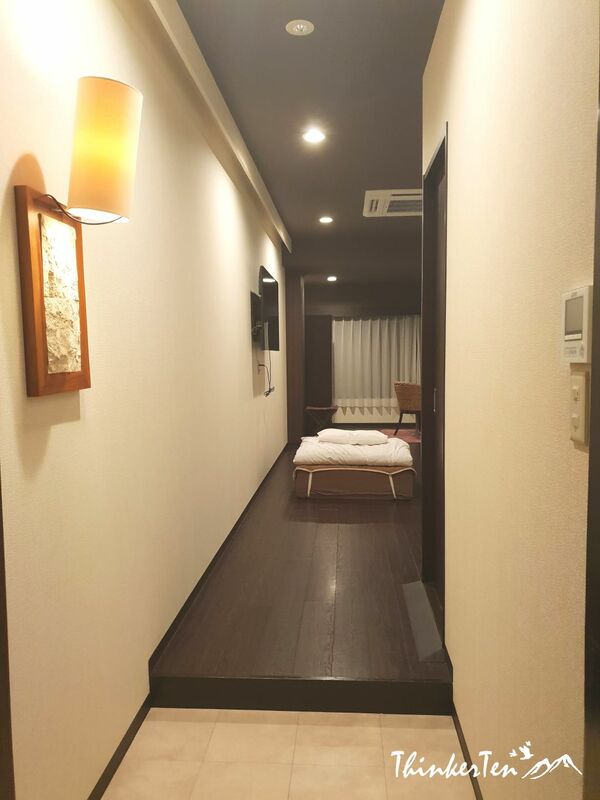 A very exclusive and spacious hotel which you dont even realised you are actually staying in Japan as most hotel in Japan are so narrow especially near the one near to the train stations. I’d love to visit Japan one day. How bad is the language barrier? Yes, you have raised a good questions, there are still many locals who dont speak English this part of Japan in Shikoku. However having said that, you can still use google translator to communicate or very simple English words not sentence to ask direction. And plenty of gesture. LOL. That’s the best part of travel. That sunset looks incredible! No wonder it’s a top tourist destination. The Bokaiso Hotel looks wonderful and inviting! Many photographers love to come up to Yashima to shoot the sunset overlooking Seto Inland Sea of Japan. my favorite country is japan and oh my god, looking at these pictures is just breathtaking. Japan is an interesting and unique places to visit. Yashima has one of the best sunset in Japan. Yes, i love Japan aside from the language barrier. But that sunset and all delicious food make me want to visit again. What captivating photos! You surely have found the right mountain for sunset viewing. Yashima looks beautiful. Thanks for the detailed information, very helpful, as I’d love to do this trip! Yashima is a hidden gem in Shikoku Islands. 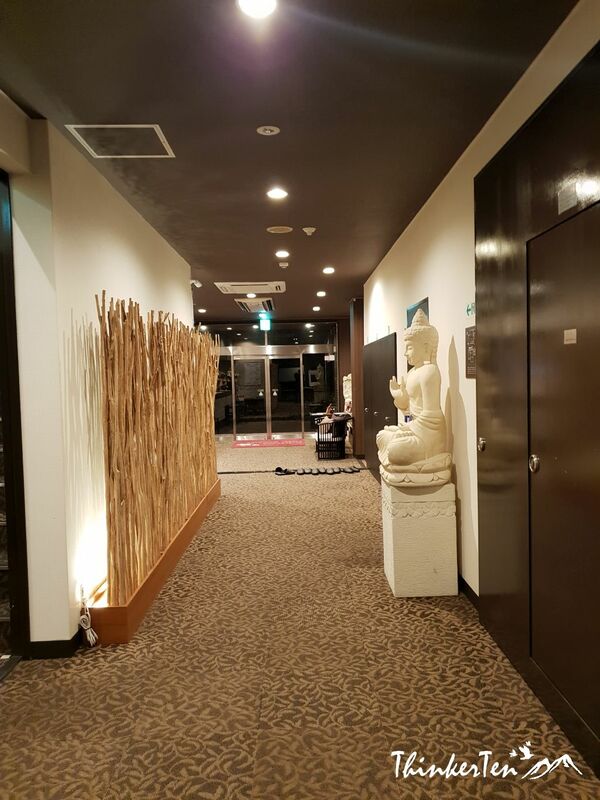 And Bokaiso hotel in Yashima offer one of the best stay in Yashima. I would like to commend you with all those stunning photos and by reading this post I can really say that you really have a wonderful trip in that place. I have never been to Japan and it sounds like a nice place to visit and to see those beautiful sunset. Japan has too much to offer, the food, the people, the manga and the robot. A mix of traditional and futuristic. Japan is one of the beautiful place to visit and it is one of my dream place to see most especially their beautiful sunset. Japan is truly beautiful and the culture is so unique. One thing I am not so comfortable is their frequent earthquake and it happen a small one (3-4 degree) during my stay in Japan. Not in Bokaiso hotel but in Osaka few days later, Kansai Japan. The hotel looks really lovely! it was interesting to read that the traditional way of leaving the shoes at the door and then take the slippers off once you enter the room is still maintained in a western style hotel. The view from the room is really breathtaking! I guess you are the only one who is so observant to realise the difference. 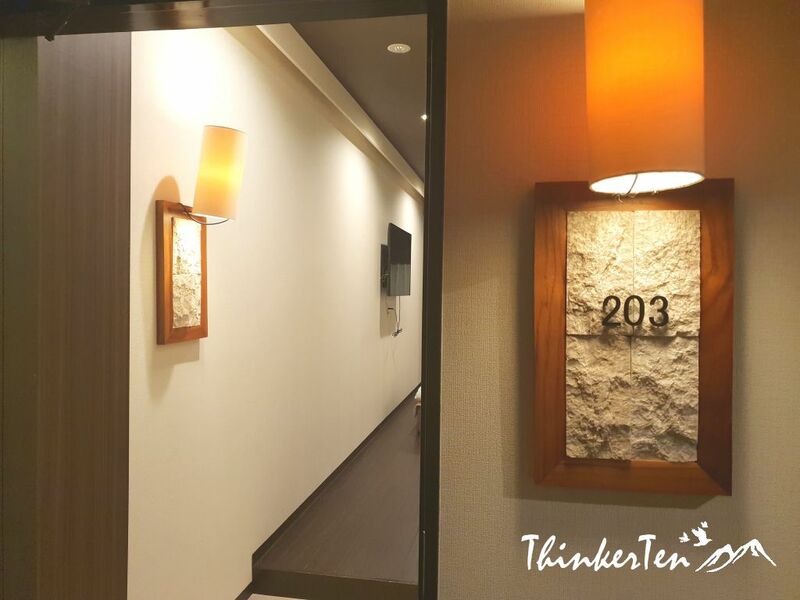 This little space before entering the hotel is called Genkan – a traditional entryway to put your shoes and wear your shoes. It also serve as a place for “inside” and “outside” in Japan. Japanese has this concept of dividing people into in-groups and out-groups. Part of Japanese culture. Wow..I have never heard of this beautiful places. It looks really nice. Want to book a trip to there. 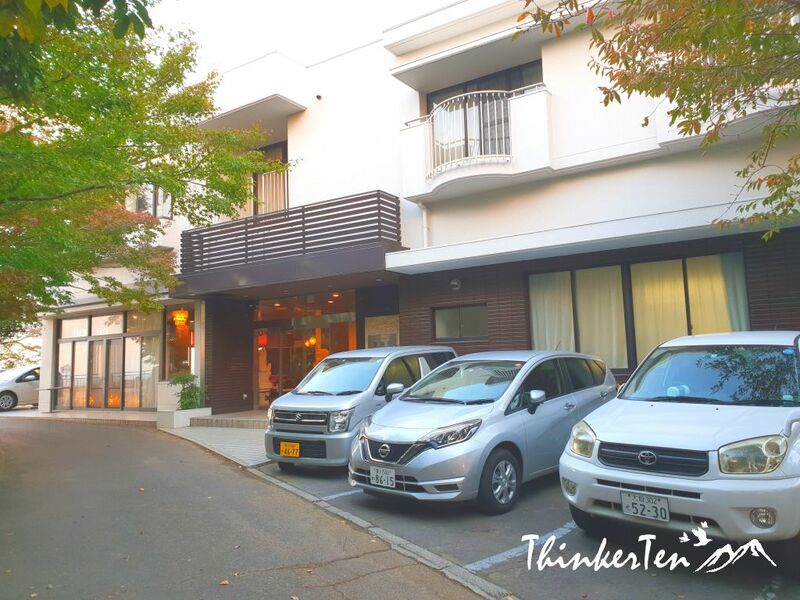 The Bokaiso Hotel offer the best sea view from your hotel room, overlooking the beautiful sunset and Inland Seto Sea during your whole stay. Someday, I will make it to Shikoku! I really want to visit the tiny island villages on the Great Seto Expressway. Shikoku is untoched as compared to other bigger islands in Japan. Plenty of hidden gems. Thank you for your comment. The sea view is amazing especially during sunset. It is one of the best place to catch sunset in Japan. What a beautiful place to experience those stunning things and delicious delicacy food to offer. Perfect place for honeymoon. 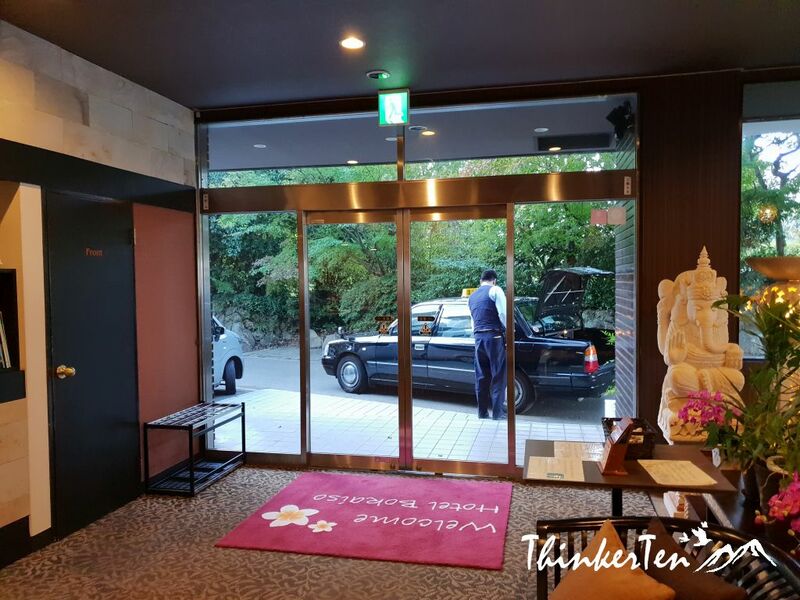 You are right, Bokaiso hotel is perfect for honeymoon couple as this place is very exclusive and quiet and best of all, it has the seaview facing room overseeing Inland Seto Sea of Japan. A wonderful sunset is a perfect day to end. What a perfect trip this would be! Beautiful, modern accommodations and plenty of culture enrichment nearby. Such an incredible place to visit for sure!